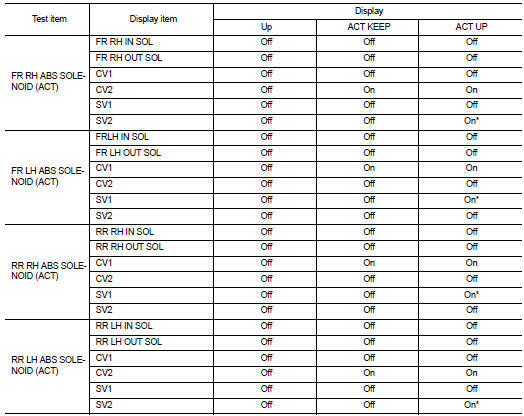 CONSULT-III can display each diagnostic item using the diagnostic test modes as follows. *1: The following diagnosis information is erased by erasing. • Freeze frame data (FFD) *2: Although “Function Test” is selectable, do not use its. ABS actuator and electric unit (control unit) part number can be read. Refer to BRC-142, "DTC Index". When “CRNT” is displayed on self-diagnosis result • The system is presently malfunctioning. When “PAST” is displayed on self-diagnosis result • System malfunction in the past is detected, but the system is presently normal. 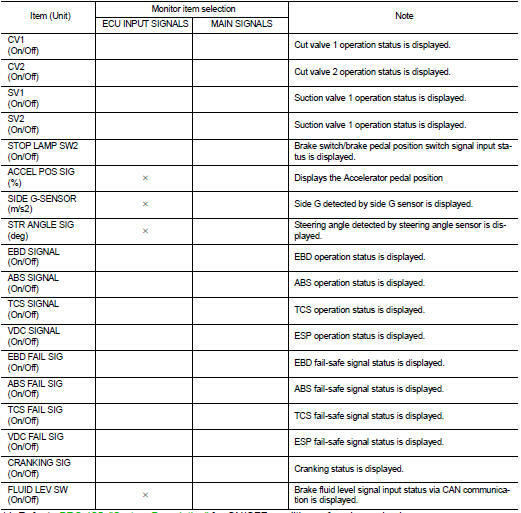 When DTC is detected, a vehicle state shown below is recorded and displayed on CONSULT-III. The active test is used to determine and identify details of a malfunction, based on self-diagnosis test result sand data obtained in the DATA MONITOR. 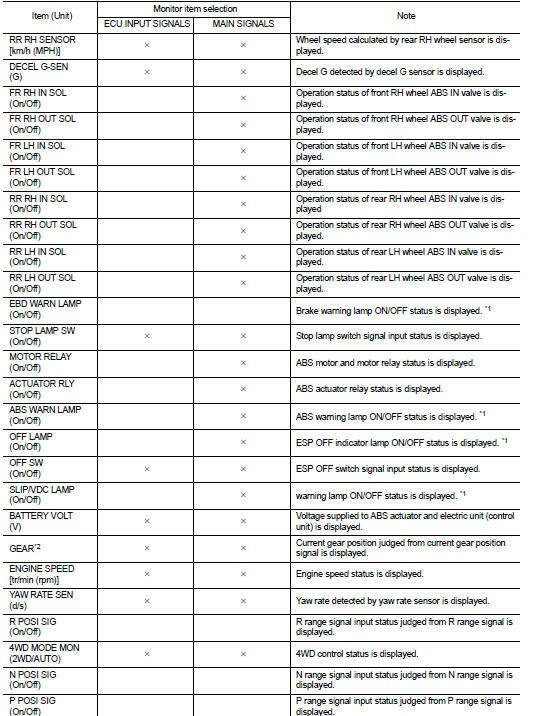 In response to instructions from CONSULT-III, instead of those from ABS actuator and electric unit (control unit) on the vehicle, a drive signal is sent to the actuator to check its operation. • Never perform ACTIVE TEST while driving the vehicle. • Always bleed air from brake system before ACTIVE TEST. • Never perform ACTIVE TEST when system is malfunctioning. • When active test is performed while depressing the pedal, the pedal depressing stroke may change. This is not a malfunction. • “TEST IS STOPPED” is displayed approx. 10 seconds after operation start. • When performing active test again after “TEST IS STOPPED” is displayed, select “BACK”. • ABS warning lamp and brake warning lamp may turn ON during active test. This is not a malfunction. ABS IN Valve and ABS OUT Valve When “Up”, “Keep” or “Down” is selected on display screen, the following items are displayed when system is normal. *: Immediately after being selected, status is “On”. Status changes to “Off” after approx. 2 seconds. ABS IN Valve (ACT) and ABS OUT Valve (ACT) When “Up”, “ACT KEEP” or “ACT UP” is selected on display screen, the following items are displayed when system is normal. When “On” or “Off” is selected on display screen, the following items are displayed when system is normal.